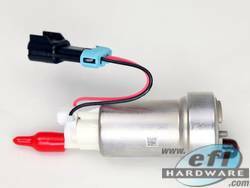 These Walbro fuel pumps are commonly referred to as a Walbro 450 or Walbro 460 fuel pump and are E85 compatible high-performance units. E85, Flex Fuel and Gasoline compatible fuel pump that flows 450 L/Hr. This is a hugely popular in-tank E85 compatible fuel pump capable of supplying 450 L/Hr. This pump is great for E85, E10, Any Flex Fuel and Gasoline/Petrol. EFI Hardware only supply genuine Walbro Pumbs with 1 year manufacturer warranty. Different fuels and engine configurations change the amount of fuel required to produce a specific amount of engine power. The table below indicates most of the variations of fuels and engine setups. Choose the engine and fuel type that most accurately matches the engine set up in your vehicle. NOTE: Most supercharger applications require a large amount of power to run the supercharger. Consult with your supercharger supplier for the amount of power your supercharger will consume and subtract that amount of power from the table below. NOTE: All Power estimates are for 3 Bar of Fuel Pressure, and are HP and KW at the engine. NEED MORE FUEL FLOW AT HIGH BOOST THAN THE WALBRO 450 CAN DELIVER? Check out the diagram below showing how the 866-800E-HP outperforms the 866-800E above 85PSI fuel pressure.